UFO SIGHTINGS DAILY: Nick Jonas Knows Aliens Exist And Wants To Learn More About Them, Nov 2015, Video, UFO Sighting News. 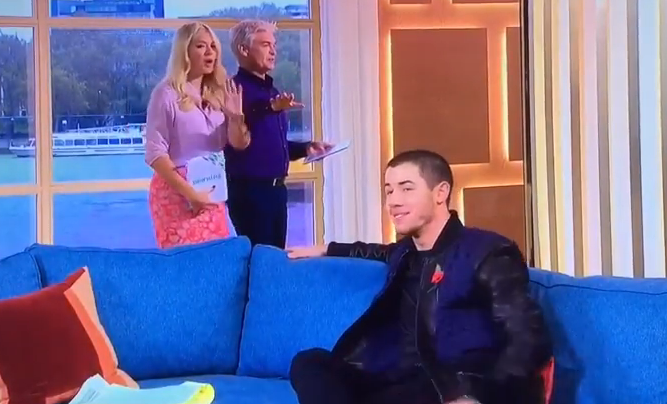 Nick Jonas Knows Aliens Exist And Wants To Learn More About Them, Nov 2015, Video, UFO Sighting News. Nick is right. Believing is different from knowing. When you know, you no longer need proof for yourself, but only to prove it to others. Are intelligent aliens in our solar system? Yes, 100%. Were there more than 20 alien species in this system? Yes. The faces we have found on Mars, Mercury, moons, have all pointed to over 50+ species. I would bet my life on it. Would you? Thats knowing over believing. Nick Jonas, 23, is the latest celeb to notice the UFO that was spotted in Los Angeles on Nov. 7. But Nick isn’t just believing the conspiracy theories, he knows UFOs are real — because he’s seen one himself! When he paid a visit to Britain’s This Morning on Nov. 9, he shared his own alien encounter from when he was a teenager! “This was probably eight years ago, I was in my backyard in LA. I looked up in the sky and there was three flying saucers.” he told This Morning‘s Phillip Schofield and Holly Willoughby, “I looked at my friend and said, ‘Are you seeing this or am I losing my mind?’ He was seeing the same thing. We go online and there were three identical sightings two weeks before….It was me, my friend, and a bunch of people in LA that saw it.” Because of his extraterrestrial experience, Nick admitted that he’s totally intrigued by the recent happenings in Los Angeles. In case you missed it, some LA and Las Vegas residents spotted a suspicious blue light in the sky on Nov. 7 that was caught on tape and looked a lot like a UFO. Although a Navy spokesman claimed it was just a Trident missile test-fired by the Navy, it had people completely freaked out — including Khloe Kardashian, Kendall Jenner, and Josh Groban! Do you believe Nick's UFO story? (more at source).